Residential Design for Aging in Place by Drue Lawlor and Michael Thomas is a comprehensive book written by two seasoned interior designers to show that universal design is good design. The book is well organized so readers can pinpoint a specific topic to learn about; however, I found myself so drawn into the information that I read the book cover to cover! The uniqueness of this book is the thorough research that Lawlor and Thomas conducted. They focus on designing homes that people can live in safely and independently throughout their lifetimes. With extensive footnotes throughout the book, readers will be guided to other documents on the subject. The authors looked at critically important issues of space design, product selection, and lighting design. The reader will be well informed on how to approach their next remodel or new build project. 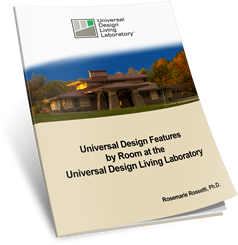 The chapters clearly describe how to create spaces including the: living area, bedroom, bathroom, kitchen, laundry, home office, and outdoor patio. Throughout the book, there are natural and artifi cial lighting recommendations. The chapter on accessible exteriors illustrates how to make the approaches to the home more level, as well as the doors wide enough for wheelchair access. I found the sections throughout the book, “Case in Point,” to be especially helpful. These short stories from the perspectives of interior designers and home owners’ gave real world examples and insights on why homes should be designed with aging in place features. The authors draw upon their expertise as interior designers, certified aging in place specialists, and adult children with aging parents who acquired diseases that limited their mobility. Thomas and Lawlor have created real world solutions for their parents, as well as their numerous professional clients. In addition, they included projects from their peers to showcase in the many photos used to illustrate the concepts highlighted. The homes in these photos are exquisitely designed and detail the principles contained in the chapters. This book is timely and will serve others for years. The book contains an extensive wealth of information in the appendices, such as names and Web sites of manufactures of specialty products. It also includes a list of professional design organizations, groups, and associations who serve as specialists in aging, interior design, and the disability community. Thomas’s motivation to write this book was the realization that he might need to secure a place of his own, one that would provide a safe, accessible harbor during his later years. His mother’s fight with cancer and subsequent fall getting out of the shower and breaking her neck, gave him the sudden realization that age can bring on expected physical challenges. As a designer, he wanted to integrate changes to the built environment that might provide a greater sense of self-control and independence, despite a disability. Because of their membership in the American Society of Interior Designers (ASID), Thomas and Lawlor became friends. They built on what they knew about interior design, but more importantly, what they wanted others in the profession to know about barrier-free living. Thomas participated in an ASID survey about baby boomers 15 years ago. The focus was to understand what the needs might be for housing for the 76 million boomers who at the time, were just beginning to contemplate their retirement and perhaps already taking care of an aging parent, family friend or relative. The survey clearly identified a need for much more barrier-free design in work and home environments. 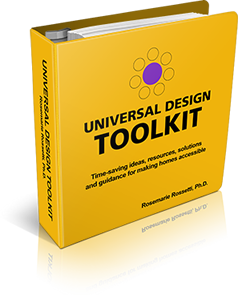 In an ASID white paper study that followed, the research indicated that universal design was one of the essential components to building greater independence for the “boomer” clients of ASID members. Thomas and Lawlor asked for submissions of interior design projects to include in their book as example case studies through their ASID member network, as well as included their own projects. This 236-page, hard cover book (ISBN: 978-0470-05614-1), was published in 2008 by John Wiley & Sons, Inc. To order this $75 book, go to: www.iageinplace.com/.